Fatigue and sore throat are common symptoms of several possible illnesses. There are three causes (chronic fatigue, mononucleosis, and the flu) that are most commonly diagnosed when sore throat and fatigue are present. Learn more about each of these common illnesses and find the treatment you need. Your fatigue and sore throat could be symptoms of mononucleosis (or mono). Mono is a contagious virus passed through infected saliva and airborne particles from a cough or sneeze. Mononucleosis treatment is focused on relieving symptoms until the mono has run its course. The flu is a contagious respiratory illness that frequently causes fatigue and sore throat. Much like mono, saliva and air borne pathogens help spread the flu virus. Bed rest and plenty of fluids are typically the best treatments for overcoming the flu. A healthcare professional may prescribe an antiviral medication, which can sometimes cause symptoms to ease faster than through rest and fluids alone. It’s never too early to talk to your healthcare provider about uncomfortable symptoms you are experiencing, such as fatigue and a sore throat. 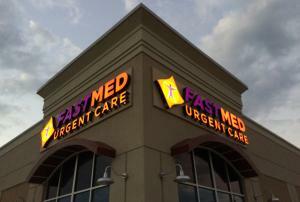 At FastMed Urgent Care, we work with you to fight off any non-life threatening illness you are facing and to prevent it from compromising your quality of life. Our care facilities are open for extended weekday hours and on the weekend, and you can simply walk right in; no appointment needed! We’re here to help diagnose your fatigue and sore throat symptoms and quickly get you back on the road to recovery. Like us on Facebook and follow us on Twitter to find out more about FastMed in your community.